ISLANDIA, NY--(Marketwire - Sep 11, 2012) - Summer may have just ended, but the holidays are just around the corner, and the Islandia Marriott Long Island is offering early planners the chance to save big on holiday parties at its Long Island meeting facilities. When you book your holiday party at this hotel in Islip by October 31, 2012, you'll enjoy special menu pricing on both sit-down and buffet meals, plus a number of benefits that will give you even more reason to celebrate the season. With these Long Island hotel packages, you'll get holiday decor, including centerpieces, festively colored napkins, votive candles and a Christmas tree or menorah; directional and place cards; a personal maître d to assist with every detail of your event; discounts on overnight accommodations and Marriott Rewards® points for the planner. In addition to expert Islandia event planning, this Long Island hotel is excited to offer delicious holiday menus for parties of every size. Sit-down menus offer a choice of one appetizer, one salad, three entrees, one dessert and freshly brewed coffee (including decaf), tea and soda for $36.95 per person excluding administrative charge and sales tax. Menu items include penne a la vodka; classic Caesar salad; herb-crusted pork loin with wild mushroom sauce, rosemary roasted red bliss potatoes and asparagus; grilled NY strip steak with red wine demi-glace, horseradish whipped potatoes and asparagus; freshly baked rolls with butter; red velvet cake and tiramisu. Buffet menu options include a choice of two salads, two entrees, a carving station and an assortment of desserts, plus freshly brewed coffee (including decaf), tea and soda for $40.95 per person excluding administrative charge and sales tax. Dishes include fresh field green salad with candied walnuts, dried cranberries and gorgonzola cheese; breaded eggplant rollatini; salmon medallions over whole grain mustard beurre blanc and a carving station with roast turkey and delectable sides. Desserts include cakes, pastries, cookies and pies. Beverage and reception packages are also available, and parties must host a minimum of 50 guests. To book your holiday party package, contact the catering office at 631-232-3000 ex. 7124. 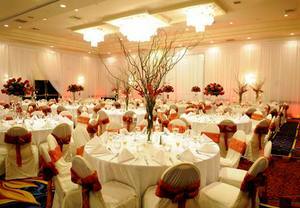 To learn more about the Islandia Marriott Long Island and its elegant event space, visit the hotel website at http://www.marriott.com/hotels/travel/ispis-islandia-marriott-long-island/. Just off the Long Island Expressway and 10 minutes from Islip MacArthur Airport is a beautiful hotel with the amenities you need as a business traveler and the comfort you crave as a vacationer. With a light-filled atrium setting, this Hauppauge, Long Island hotel offers 278 spacious guestrooms and 13 suites, each outfitted with plush bedding, flat-screen TVs with movies on demand, moveable desks, high-speed wireless Internet access and in-room coffee/tea service. Concierge-level rooms offer additional amenities and lounge access with breakfast and evening snacks. Business travelers will appreciate a location near CA, Motorola, Hauppauge Industrial Park and Stony Brook University, while those wanting a little recreation can head to nearby Jones Beach, Splish Spalsh Water Park, North Fork Wineries, Tanger Outlets, Baseball Heaven, Robert Moses State Parks and the Hamptons. Dining at this Long Island hotel takes advantage of the beautiful atrium setting. Find an elegant atmosphere and modern American cuisine at Bistro Fifty-Eight or crafted cocktails and light fare at the Atrium Bar. Relax at this hotel's indoor heated pool and whirlpool, or get moving at the newly renovated fitness center. A convenient location, generous amenities, more than 12,000 sq. ft. of function space and onsite event managers make Islandia Marriott Long Island ideal for weddings, events and meetings.